The two-dimensional crystal film of streptavidin (SA) has been prepared at the air/water interface and transferred onto hydrophobic silicon wafer. The transfer ratio has been improved from our previous studies, resulting in the entire covering of the surface of silicon wafer with 2D crystal domains of SA. Stable and controlled immobilization of biotinylated proteins in their active form is to be achieved on this SA surface. Binding of biotinylated protein G to the SA surface and thereafter immunoglobulin G (IgG) to this immobilized protein G have been demonstrated by atomic force microscopy (AFM) under water. The biotin-streptavidin linkage is so stable that the bound protein G/IgG complex withstands the lateral pressure of the AFM cantilever tip during scanning. The number of bound molecules can be counted directly in the AFM images, suggesting the possibility to develop an AFM-based protein device in which the binding assay is ensured at high signal to noise rarios. 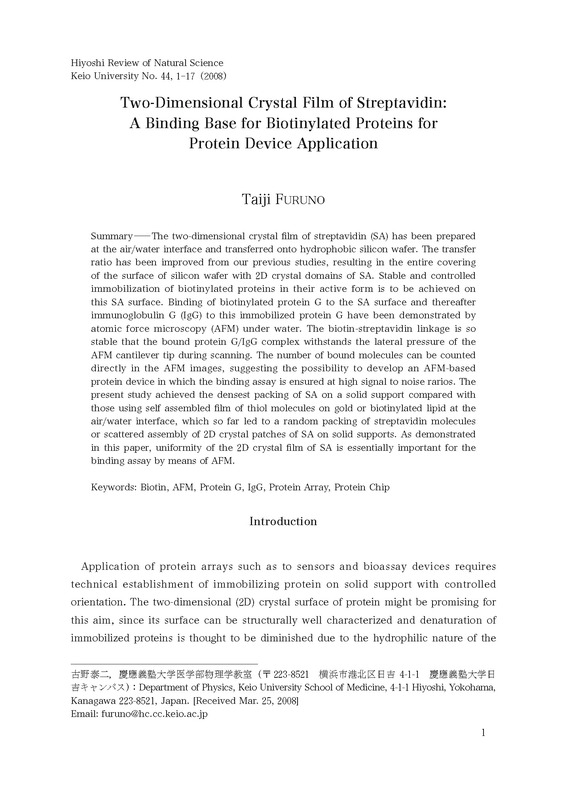 The present study achieved the densest packing of SA on a solid support compared with those using self assembled film of thiol molecules on gold or biotinylated lipid at the air/water interface, which so far led to a random packing of streptavidin molecules or scattered assembly of 2D crystal patches of SA on solid supports. As demonstrated in this paper, uniformity of the 2D crystal film of SA is essentially important for the binding assay by means of AFM. 5. Preservation of SA film.